Volume 1 & 2 of Michael Collins Piper’s most famous work, now in its Seventh Edition. Documents that JFK’s efforts to prevent Israel from building nuclear weapons of mass destruction played a key role in the conspiracy behind JFK’s assassination. 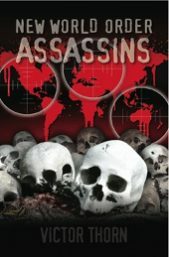 Elements of the CIA and organized crime were involved in the JFK conspiracy, but the role of Israel’s intelligence agency, the Mossad, was the long-suppressed “missing link” that was finally unveiled in this titanic work. 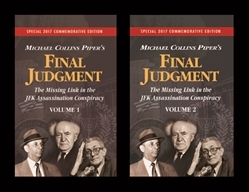 When Final Judgment was first released in 1994, even some critics of Israel were skeptical of Michael Collins Piper’s allegation that Israel’s intelligence agency, the Mossad, had been involved in the JFK conspiracy. Despite this, Final Judgment became an overnight “underground best-seller” and now—more than two decades later—continues to be “must” reading among patriots all across America. 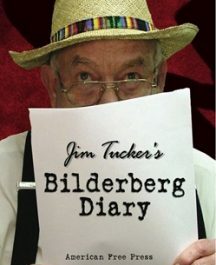 In spite of intense opposition, more than 50,000 copies are now in circulation throughout the U.S. and around the world. Yet, now, copies are harder than ever to come by. Described by many readers as the definitive “last word” on the JFK conspiracy, Final Judgment has sparked headlines in newspapers here and abroad. 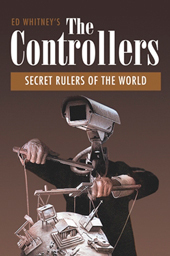 And the Israeli lobby has worked overtime to try to stop this book from being distributed. Final Judgment dissects the theories you’ve heard over the years about the JFK assassination and demonstrates the one little-known thing they have in common: the long-secret Israeli connection. 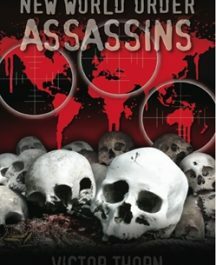 Now in two volumes, this extraordinary work demonstrates beyond any doubt that JFK was involved in a bitter, behind-the-scenes battle with Israel over that nation’s determined effort to build nuclear weapons of mass destruction, and that the Israeli connection to the murder of President Kennedy is the common thread that ties together the whole amazing story of the JFK assassination in a way that finally makes sense. Final Judgment: Volume I contains the main text of the book plus Mike’s amazing photo section (softcover, 425 pages). Final Judgment: Volume 2 comprises the 10 extremely detailed appendices referenced again and again in the main body of the book (softcover, 374 pages).